Founded in 1888, American Excelsior boasts a rich history in the packaging industry. Today, AEC also provides solutions for engineered foam and erosion control. For more than 125 years, American Excelsior’s philosophy has remained the same: deliver quality products in a timely manner. Since the company’s inception, the products have changed, but AEC’s philosophy has remained constant. American Excelsior delivery truck, ca. 1930. 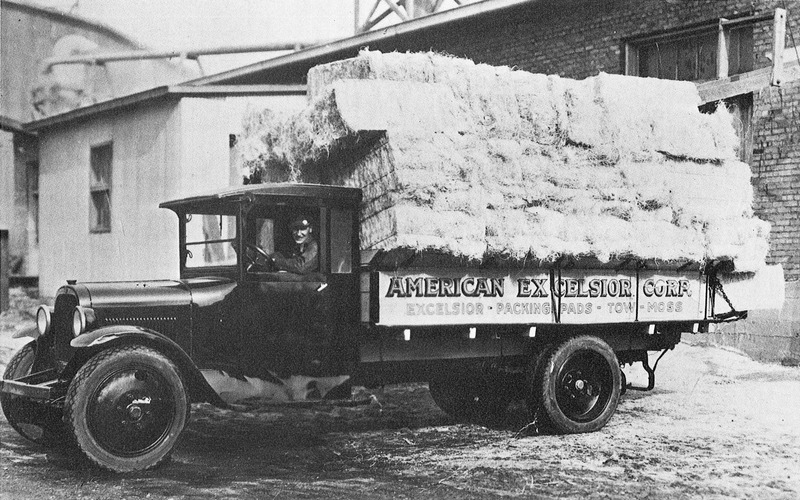 American Excelsior got its start by producing wood excelsior – stranded wood fibers manufactured from aspen trees – for use as protective packaging in wood crates and as filling material for bedding and furniture products. Today, American Excelsior operates the largest excelsior mill in the country, located in Rice Lake, Wisconsin. This natural, renewable resource is still manufactured by the company for packaging, erosion control, and evaporative cooling pads, as well as for archery targets and floral/craft filler. As the industry developed new packaging materials and solutions, AEC continuously adapted, manufacturing and marketing the latest products for each decade – wood excelsior in the early 1890s, cotton batting in the 1920s, excelsior pads in the 1940s, foam rubber in the 1950s, polyurethane foam in the 1960s, polystyrene loose fill in the 1970s, starch-based packaging and molded polyurethane products in the 1990s and new viscoelastic foams for seating along with new innovations for erosion and sediment control in the 2000s.